For many dedicated golfers, the game is much more than a hobby. It’s a lifelong skill that takes years to master. Even if they don’t get to spend as much time on the green as they’d like, golfers will gradually improve their skills and technique throughout their lives. Along the way, they’ll hit milestones that’ll make all of the practice and progress worthwhile. We’ll dive into the details below, but we also put the keypoints of each stage in this infographic. Please include attribution to Hix Magazine with this graphic. Players young and old go through different stages of golf improvement. Everyone starts in the same place and works for years to reach the next achievement. The great thing about the game is that golfers can play with each other regardless of what stage they’re on. With varying levels of handicap designed to even the playing field, new golfers and seasoned professionals can work together to reach their full potential. If you’re new to golf, it’s good to know how you’ll progress over time. These golf improvement stages aren’t concrete, but they’ll give you a better idea of where you stand and how to improve. While natural ability surely plays a role in how fast you’ll advance, it’s only a matter of time before you move onto the next level. Of course, practice and additional training can make all the difference. Probably one of the most exciting stages of golf starts in the beginning. To most golfers, this stage occurs when the first set of clubs are purchased. No longer are you renting or borrowing from a friend. You’ll more than likely invest in beginner clubs that are designed to help you improve. You’ve made the investment, so it’s time to start your journey to becoming a great player. In this stage, golfers will spend more time on the course. It may be frustrating because the game is fairly new. You’ll need to get used to the feeling of swinging the clubs and get a better understanding of the game as a whole. To move forward, you need to stick to the game. It’s all about building a foundation of skills and building upon them. You’ll learn new things about the game from continued practice. You may also pick up a few things from seasoned players around you. Most new golfers spend up to a year or so in this stage. It’s when the game becomes less of a casual hobby and more of a serious skill. At this point, you’ve probably been hitting the course casually a few times a month with friends. While your game isn’t perfect, you’ve seen a noticeable improvement with putts and drives. Finishing a game with a score of around 120 is the moment you’re no longer a newbie. 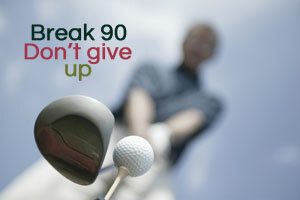 Now, you can focus on sharpening your skills to become an impressive golfer. Practice is key! It’s a good idea to visit the course more frequently. A trip to the driving range is also beneficial. Golf is all about repetition. As you get more comfortable swinging the club, you’ll be able to have better control over where the ball goes. Those blind shots into the green will become more precise. You’ll need to realize what skills you have and where to improve. It’s a good idea to invest in a golf swing analyzer. These devices analyze swing data and provide you with valuable information you can use to get better. It will take up to 4 and half years of practice to move on to the next stage. It can take years to reach this stage, but the moment you hit 100 will make it all worth it. Chances are, you’ll get very close to this milestone numerous times before you actually make it. It’s important to relax and enjoy the game. Stressing will only affect your swing. Golfers need to keep calm and play the game rather than think about the score. To improve beyond a score of 100, you need to spend more and more time on the course. It can be difficult for golfers to move onto the next stage, so it’s a good idea to visit the course at least once a week. You can also invest in a home golf simulator. This will allow you play the game anytime while getting information to improve your technique. Golfers will spend 1 to 2 years on average in this stage. This is a unique stage in golf because it’s difficult to reach. It’s not uncommon for casual golfers to plateau before reaching this stage because they have a hard time carving out those last few strokes. To hit this stage, you need to start planning your shots accordingly and thinking ahead. You need to realize your skills and make changes to get better, no matter how hard it is to stray from what you’re used to. Getting to the next stage requires you to take a harsh look at your skills. You should be looking at each and every course and strategize your game based on your skills. You also need to look at how you perform with every club in your set and use the clubs that allow you to achieve the best results, regardless of what they’re designed to do. These changes can make a huge difference. They help you avoid that plateau and shave off those final few strokes, dramatically improving your rate of improvement. If you break into the 80’s and can do so fairly consistently, you’re probably one of the better golfers out of your group of friends. Most casual golfers can’t achieve this. It’s a great milestone that will set you apart. To improve further, you’ll want to focus on the areas that need improvement the most. It’s a good idea to start keeping track of your swings. Moving onto the next stage requires fine improvements, so statistics are key. Keep tabs on your weaknesses, whether it’s fairways, greens, or putts. Instead of focusing on what you’re already great at, spend more time where you need improvement. Ideally, you should work on your game at least twice a week. Golfers can spend up to a decade or more making these small improvements to reach the next milestone. At this point, you’re becoming one of the best players in your group. Reaching a score in the 70s on a regular basis is a great feat, but there’s still room for improvement. Physically, it’s important to stay fit. While golf carts are a great luxury, the real game begins when you walk the course. Sure, you may be able to play great if you’re relaxed, but what about when you’re physically tired? To get even better, make sure that you’re mentally and physically fit. You can hone your skills further by walking the course. It’ll teach you how to continue your progress without feeling fatigued. It’s also important to stay mentally focused. At this stage, you’re likely hitting great shots with the occasional flub. Work on your mental game to ensure that every shot is consistent. If you’ve reached this level, you’ve done something that most players only dream of. Becoming a scratch golfer is something all golfers work towards. Your handicap is zero and you can play a game of golf on par. This is very rare, so you’ll be highly respected by every player at your course. If you haven’t already, you may want to enter some tournaments to challenge yourself further and improve. If you want to progress further, that usually means turning pro and dedicating a lot of time to the game. Essentially, this is when golfing becomes your career. It’s important to challenge yourself physically and mentally to get even better. Enter tournaments to get out of your comfort zone and become the best player you can be. If you want to go on to the next stage, you need unlimited access to a golf course and professional training to make small improvements. These small changes can make a huge difference in your game and allow you to compete professionally. Reaching the final stage is very rare and can take decades to achieve. At this stage, you’re competing professionally with the big dogs on a professional tour. Every shot counts, so it’s important to stay relaxed and focused, despite all of the attention and judgment you are getting. If you’re lucky enough to get to this stage, you’ve essentially mastered the game. The only thing left is to keep up your technique so that you can continue to play the game successfully. While it takes a lifetime to move through the various stages of improvement, the experience of developing golf skills is rewarding. In the beginning, you’ll struggle to make the ball go where you want it. Eventually, you’ll become a respected player that can make successful shots while still having fun. By sticking to the game and aiming for these milestones, golfers can reach their full potential.